The Bitta Kidda Baby Soother Sleeping Bag Wearable Blanket + Lovie is the answer to baby's bedtime routine! Safer alternative to stuffed animals or blankets in the crib, an easy-access diagonal zipper for diaper changes, and an internal diaper cover to prevent twisting, the self-soothing Wearable Lovie makes for more restful sleep: babies and parents agree! PERFECT BABY SLEEPING SACK? We think so! Bitta Kidda Wearable Blanket has all the bells and whistles of a typical sack, but comes with special features no other one has: patented Wearable Lovie is safe for baby to have in the crib, this alone makes it worth it. But there's more: an internal diaper cover acts as a onesie bottom, allowing the sack to move smoothly with baby - no more tangles! 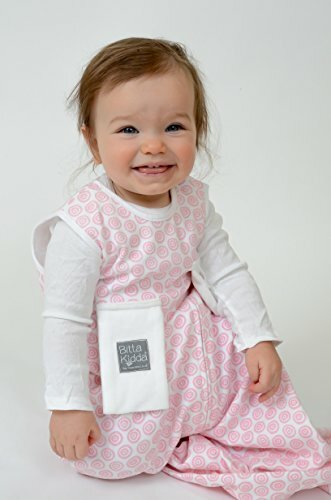 SAFETY 1ST: The Bitta Kidda Wearable Blanket is a safer alternative to extra items in the crib - now baby can safely snuggle with the blanket-soft, Wearable Lovie at naptime or bedtime without hesitation! SELF-SOOTHE: Wearable Lovie allows baby to self-soothe throughout the night. Strategically placed on the sack, the crib-safe, attached lovies will help baby learn to sleep soundly. Quick and Easy: A patented diagonal zipper creates easy-access for diaper changes, yet still allows baby to cuddle the lovie. Bonus: No zipper ends to match up and baby can't unzip themselves (zipper ends under the arm and is covered by a tab). RESTFUL SLEEP: Internal diaper cover is a game-changer for sleeping sacks. Acting as a onesie bottom, baby won't get tangled in the fabric. The sack moves as they do, allowing baby (and you) to sleep more soundly! This clever sleeping sack was thoughtfully designed with the needs of parents and baby in mind, and is recommended by professional sleep consultants. The Wearable Lovie gives parents peace of mind, while their little ones drift off to sleep (and stay asleep). And as baby gets older, the Wearable Lovie saves the day because it can't be tossed out of the crib. BONUS! A simple idea that will make bedtime and naptime SAFER! The soother sleeping bag is a wearable blanket with attached extra loveys that allows your baby to have the comfort of a stuffed animal, and the softness of a blanket to snuggle in their crib, without the worry. GENIUS! There's more: the patented, diagonal zipper feature makes middle-of-the-night diaper-changes a snap! Because the sack zips like a dress (instead of a jacket), there is no need to fumble with matching up the zipper ends - all while your baby is content to snuggle the attached lovie. And, since the zipper ends under the arm (and is covered by a tab), you don't have to worry about your baby unzipping themselves. Even as your child grows, the Wearable Lovie is key - no more flinging the lovie out of the crib during the night, which means a more restful sleep for your little one (mom and dad too!). It gets better: the internal diaper cover acts as the bottom of a onesie allowing the sleeping sack to move as your baby moves. Because your baby won't get entwined in the sack fabric, they will sleep more soundly - BONUS! Made from 100% cotton, (and the attached lovies 100% cotton velour), your baby will quickly learn to self-soothe by being able to cuddle with the easy-to-reach, blanket-soft lovies all throughout the night (or naptime). All Bitta Kiddas meet Consumer Product Safety Commission requirements for children's sleepwear. If you have any questions about this product by Bitta Kidda, contact us by completing and submitting the form below. If you are looking for a specif part number, please include it with your message.